Henry Sotheran Ltd: Positively Serendipitous! As a bookseller, its always a great feeling when you have the opportunity to make a sale comfortable in the knowledge that the item in question is going exactly where it should be. Whether its sourcing the missing volume to complete a much-loved collection, or finding the perfect gift for even the most esoteric of tastes, there is a certain satisfaction when it all comes together. What then could be more fitting than to reunite a rare item with the very institution who published it? the computer and the arts. This wonderful poster, advertising the 1968 exhibition at the Institute of Contemporary Arts, Cybernetic Serendipity, was, remarkably, until very recently absent from the ICA archives. Stumbling across the poster (and accompanying catalogue - also previously missing from the ICA collection) by chance at Sotherans couldn't have come at a more opportune time for the gallery, as just a few weeks ago the ICA launched a new book featuring the show and an exhibition opened by the curator of Cybernetic Serendipity - Jasia Reichardt! The first in-depth examination of the gallery during this period, Institute of Contemporary Arts: 1946 – 1968 culminates in 1968 with Cybernetic Serendipidy. Coinciding with the publication is an ICA Off-Site project, just around the corner from Sotherans, at Dover Street Market. 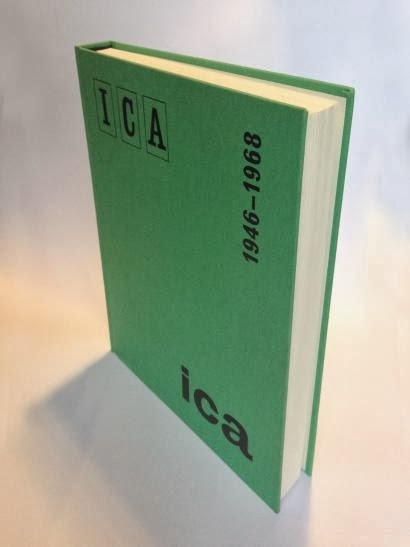 For the project the ICA occupies all 6 floors with reproductions of rarely-seen material from the ICA archives. Also running until the 6th of April is Richard Hamilton at the ICA, recreating two of Hamilton's installations first shown at 17-18 Dover Street in the 50's, they are a must-visit for anyone excited about the retrospective of Hamilton's work currently at the Tate Modern. First shown at the Institute of Contemporary Arts in London and curated by Jasia Reichardt (b. 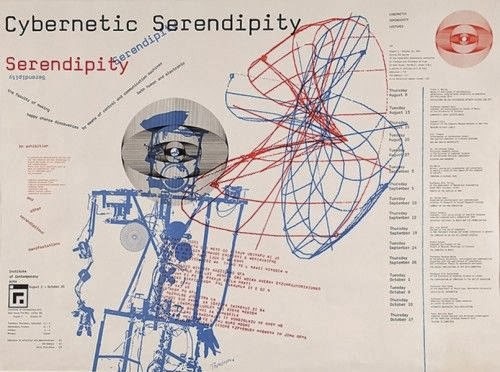 1933) Cybernetic Serendipity (1968) was a seminal exhibition that is still widely regarded today as a landmark in the development of the digital and electronic arts. With over 130 contributors, including John Cage and Nam June Paik, the exhibition showcased the work not just of artists but of composers, poets, engineers, doctors and computer scientists. A curator and writer, Jasia Reichardt went on to become the director of the Whitechapel Gallery after leaving the ICA and is the author of numerous publications. Her interest in a general sense is art and its intersection with other fields, in particular with technology but also across literature, architecture, music and science. The curation of an exhibition of this scale was no small achievement, particularly at a time when the sciences were almost exclusively male dominated and computers rarely used within art institutions. Reichardt's profound interest in such subjects can be easily traced back to her aunt and uncle Franciska and Stefan Thermerson with whom she lived after the Second World War. The Thermersons founded the Gaberbocchus Press in 1948 which, with Franciska as designer and Stefan as editor, translated and published avant-garde works. 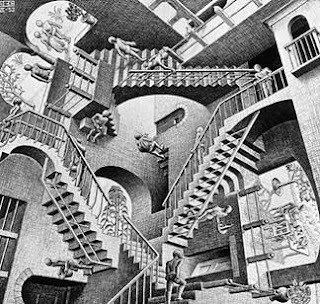 In 1957 they turned the basement of their offices into a centre for art and science - a space dedicated to 'the philosophy of science and the philosophy of art'. Ten years later Franciska became the exhibition designer for her niece's show. Cybernetic Serendipity is the best known of Reichardt's work to date. Referring to the science of communications and control systems present in both machines and living things the term 'cybernetic' is aptly coupled for the title with Horace Walpole's term 'serendipity', coined in 1754 to explain 'the faculty of making happy chance discoveries'. Exhibits included robots, painting machines and interactive installations with much emphasis on works where chance played a significant role. The exhibition was remarkable for many factors and proved to be immensely popular. The use of cybernetics to demonstrate such a range of creative uses struck notes with academics, critics and the general public and for possibly the first time it could be considered 'cool' to work with computers. Decidedly post-modern and in keeping with much of the contemporary art produced during this period the show demonstrated a shift from object-based to more interactive processes. Although not the first show to tackle the art and science debate Cybernetic Serendipity also questioned the distinctions between varying disciplines by presenting all the work on equal terms, with no accompanying text pertaining to whether the creator of a certain piece was a doctor, artist, poet or an engineer. On the whole the exhibition was very favourably received with one review stating that: 'For breaking new ground, revealing new fields of experiment, seminal importance, sheer hard work and enormous organisation, the exhibition Cybernetic Serendipity[…]is arguably the most important exhibition in the world at the moment'. Nonetheless the show wasn't without its critics. Its total reliance on machines provided a dark glimpse of a totalitarian future for some, not just for art but for society in general. 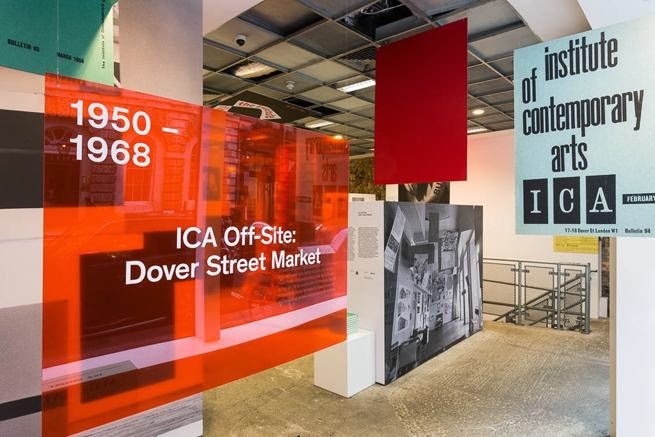 Another point of criticism was the exhibition's failure to address the part cybernetics played in modern warfare and the substantial corporate support given to the ICA in order to finance the exhibition (which included presentations by IBM and General Motors). In the decades following Cybernetic Serendipity the optimism surrounding the digital arts dissipated somewhat, with the majority of artists in the field working autonomously. However in the past decade, as we sink deeper into the digital age, there has been a resurgence of interest with various critics re-addressing the subject. Now home to the national collection of computer-generated art and design the V&A is the first British museum to comprehensively address the cultural significance of digital developments on creativity in recent years. Their two exhibitions Digital Pioneers (2009) and Decode: Digital Design Sensations (2010) undoubtedly draw reference from Reichardt's landmark exhibition of 1968.